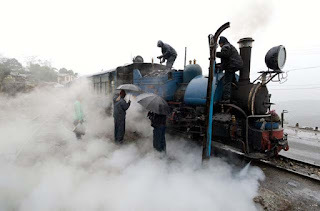 The Darjeeling Himalayan Railway has decided to introduce additional joy rides, dining coaches and chartered evening services, to pamper tourists expected to visit the hills during the Puja season that will set in from mid-September. Rides on the UNESCO-conferred heritage DHR toy train service have always been a hit with tourists who flock to the hill station all year round. And, going by last year’s tourist footfalls, DHR officials are hopeful of a bumper season this Puja and do not want to risk inconveniencing visitors. Foremost, the DHR plans to introduce three new round-trip rides in the steam engine from Darjeeling to Ghoom. Coaches have already been freshly painted and renovated for the upcoming season. “At present we have six round-trip joy rides (three each in steam and diesel engines). We want to increase the services by introducing three more rides from September 15. Tourists come to the hills primarily to take rides in the DHR. We don’t want to upset or dishearten them due to of non-availability of seats,” said Narendra Mohan, the DHR area officer. Sukna station, will also be introduced. “Presently, the Jungle Safari is operating on a daily basis. But we have decided to curtail the ride to two days on Saturdays and Sundays priced at Rs1,100 in steam and Rs 605 in diesel engines,” Mohan said, adding in the last financial year there were 56 charter services taken. Coaches have been improved and upgraded, seats have been re-structured and bigger windowpanes have been installed for better viewing, among the many changes introduced by the DHR to make the toy train service visitor friendly. “The whole exercise is to make the service presentable to the people who pay substantial amounts to take rides on the services that are on offer. Passenger amenities especially cleanliness is our focus. In Darjeeling station, we will have a manual window to sell tickets besides the online system for reservation. We will outsource work to keep the Darjeeling and Ghoom stations clean,” the DHR area officer said. Plans are afoot to install Victorian style clocks at some stations along the 87km route from Darjeeling to New Jalpaiguri station. Electronic signboards will also give way to blackboard signage to share information about a particular station, to give tourists a heritage feel. A new idea of handing souvenirs at the time of purchasing tickets personally from the counter will also be introduced. The official also said that some tour operators from Germany have shown interest in hiring goods chartered services in November of this year for which trial runs would be conducted soon. “We will be doing trial runs next month. We had stopped goods chartered services in the 1980s. However, we have again decided to take this up and also want to see if it can be viable,” said Mohan. The DHR is hopeful of a bumper season going by the previous financial year's footfalls. “There has been substantial increase in tourist flow. Last year we had 1 lakh tourists against the previous year’s 60,000 to 65,000. This year we are targeting 2 lakh tourists. Our revenue for the year 2015-16 has increased to Rs5.45 crore from Rs3.24 crore in 2014-15 and Rs1.84 crore in 2013-14,” Mohan said.